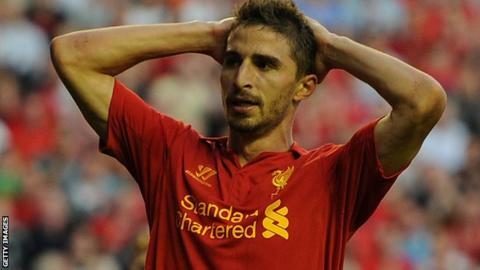 Liverpool striker Fabio Borini has been ruled out for the rest of the season, according to Reds boss Brendan Rodgers. The Italian was forced off during the 5-0 win over Swansea after landing badly from a challenge just six minutes after coming on as a substitute. "It looks like he has a dislocated shoulder which will keep him out for the season," said Rodgers. "He suffered a similar injury while at Chelsea but on the other side. It's a big, big blow for us." Borini has struggled with injury since signing from Roma in the summer and was ruled out for three months in October after breaking a bone in his foot while on international duty. The injury was the only negative on a day when Liverpool scored five goals, kept a clean sheet and had 33 shots, including 18 on target. "It was a brilliant performance, big credit to the players, their attitude was tremendous and it was important to keep a clean sheet," added Rodgers. There were five different goalscorers, including Philippe Coutinho, who scored on his full Liverpool debut. "Once he gets used to the tempo and the speed of the Premier League he will be a big asset to us," said Rodgers. "He was excellent; he got some great touches, has a really powerful shot on him and he will only get better." Liverpool's third of the afternoon was no doubt Rodgers' favourite as intricate passing and movement carved open the Swans defence before Jose Enrique slotted home. "It was wonderful combination play," said Rodgers, who claimed a victory over his former side. "We have got some technically gifted players here and the third goal showed that. It was very pleasing. "It was a very good performance on the back of a long, hard week so I was very proud of the players. "We frustrated ourselves on Monday against West Brom and we looked loose in the Europa league on Thursday. We wanted a response and they were fantastic. "Performances like this give players confidence to take into the next game."